Winter hardy to USDA Zones 10-12 where it is best grown in medium moisture, well-drained soil in full sun. Plants prefer consistently moist soils during the growing season with reduced moisture in winter. Plants appreciate some light afternoon shade, particularly in hot and humid summer climates. Established plants tolerate some drought. 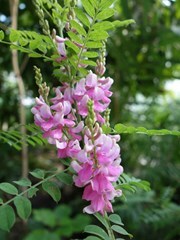 Indigofera tinctoria, commonly called true indigo, is a deciduous spreading tropical shrub or subshrub of the pea family that typically grows to 2-3’ tall and as wide. As suggested by the common name, this shrub was the original source of the blue dye known as indigo. It is probably native to China, tropical Asia and parts of Africa, but the specific location is not entirely clear because this shrub has been in cultivation since at least 4000 BC with introduction and naturalization taking place in many places around the world before good records were kept. It became a cash crop in the Southeastern U.S. in the 1700s where it has now naturalized in some areas. Leaves of this plant contain indican. Dye is obtained by fermentation of the leaves which converts the indican into the blue dye indigotin. True indigo features light green pinnate leaves (each with 4 to 7 pairs of leaflets) and short racemes of summer-blooming pink or violet flowers. Flowers are followed by seed pods (to 2” long). True indigo is much less in demand today for commercial dye purposes because of the creation of synthetic dyes which have now taken its place for most purposes. Plants are still commercially grown, mostly on small farms, for those desiring natural dye, premium clothing companies, amateur gardeners, and traditional medicine. Specific epithet from Latin means used in dyeing. Borders. Small hedge. Specimen. Ground cover. Group or mass. Containers.